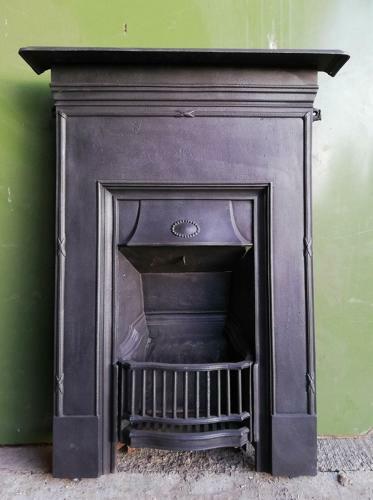 A classic style Edwardian cast iron bedroom fire, C.1910-1920. The fire is of a petite size and has a pretty and traditional appearance. The fire has original, shaped front bars and attractive canopy smoke hood with decorative oval detailing. The fire has simple mouldings and a small decorative cross. The fire has been blacked and polished and has a good colour and finish. The concrete fire back is present. The mantel is original to the fire and it clicks in to place. The mantel will be secure once the fire is installed but is loose while not installed and will need to be separate to the fire for transportation. The fire is in very good condition but has some small signs of age and wear. The fire has some small casting marks and scratches. The back has surface rust as expected and there are some very small patches of surface rust to the grill. Some light marks can be seen on the front face due to age. The fire is a petite item with a pretty style, perfect for a bedroom. The fire has a classic look that would suit a period or modern property.